Quazar™ is a revolutionary perimeter monitoring and community protection system. An industry first, this cutting-edge solution consisting of a number of gas monitors linked together, offers enhanced Emergency Preparedness and Operational Excellence for United Safety’s clients. Utilizing both RF and Web technologies, the Quazar™ offers real-time monitoring by allowing authorized personnel to log in and access the system’s information from anywhere in the world. A key differentiator with the Quazar™ is its ability to communicate wirelessly across multi-platforms including VHF, UHF, wimax or gsm. The system provides users with accurate and reliable information that they can use to diagnose and fix a situation remotely. 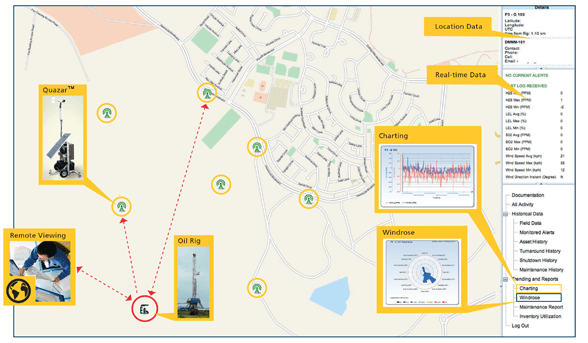 While the Quazar™ is an excellent gas monitor, it performs a number of other valuable services including data logging, charting and wind speed and direction tracking. To find out more about the Quazar™ , request a product demonstration here.